kidnepro.com » Blog Archive » Kid Nepro Arturia Moog Modular V Collection Now Available! Kid Nepro Arturia Moog Modular V Collection Now Available! The Patch King continues doing what he does best – make patches! 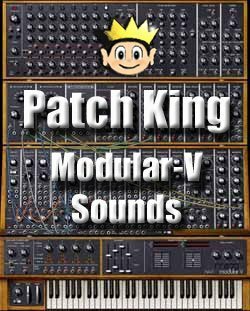 Now releasing a cool mix of 100 new virtual analog patches for the Arturia Moog Modular V. The original Moog Modular system was the instrument that originated the term “patches”- referring to the patch cord used to “patch” one module to the next. The sound created was called a “patch”. Our third release for Arturia’s V Synths following our Minimoog V and ARP2600 V sound libraries includes the usual quality analog mix of synth basses, leads, pads, synth sounds and amazing rhythms using the Moog Sequencer. All done with attention to detail including many modulation and aftertouch effects. All thrill and no fill! More sounds will be coming soon for the rest of of Arturia’s V Collection including the CS80-V, Prophet-V and Jupiter-8V. Get on our mailing list and stay updated on all the latest releases. Special Bundle Pack! Get all three of our Arturia V collections for only $60. That’s right! Get our Minimoog, ARP2600 & Moog Modular sound libraries for only pennies per patch! 300 new sounds for only $60. More info and MP3 demos at The Arturia Section Of Our Web Site!! !